My new saw arrived on Monday in great shape. I had a chance to make a little sawdust last night, and all I can say is....Wow........just WOW.......... Henry Disston himself would be envious! 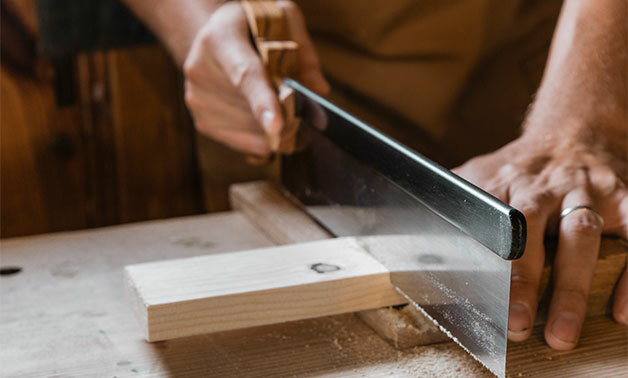 The Japanese say that a properly handmade saw will follow a line by itself....... well, this saw sure does....beautiful blade, absolutely bone straight, and just surgically sharp, follows a scribe line like a bloodhound, an absolute joy in the hand! As to fit and finish, oh my..........you've built a real winner here. She's a real beauty, and I can't get over how the handle fits in my hand...you couldn't have fit me better if I had been standing beside you......an absolutely perfect fit, and the hang is just right for me. And the apple wood is just gorgeous!! The overall look of her is just stunning, absolutely impeccable craftsmanship. 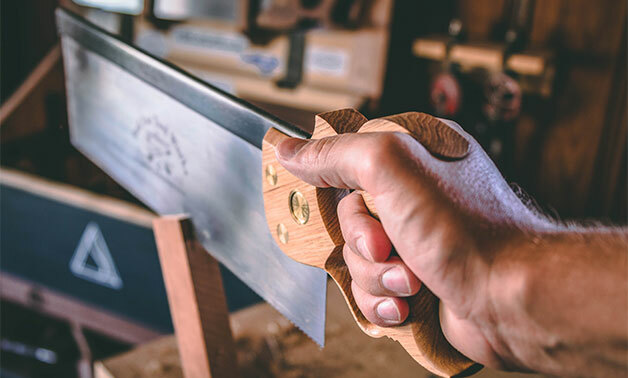 Disston and Wheeler have nothing on you, sir.......I am further convinced that yours are the finest saws being made today, and that they will become heirlooms for us to pass on to future generations. All in all my new saw is absolutely the best saw I have ever held in my hand. A happy and prosperous New Year to you, and to your family, and to your colleagues at Bad Axe. 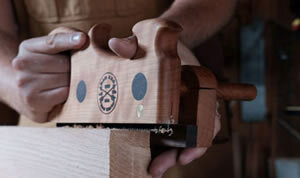 Best saws on the planet! Cheers! Mark, I got the saws a few days ago . . . I just tried them out and have to say they are freaking unbelievable. 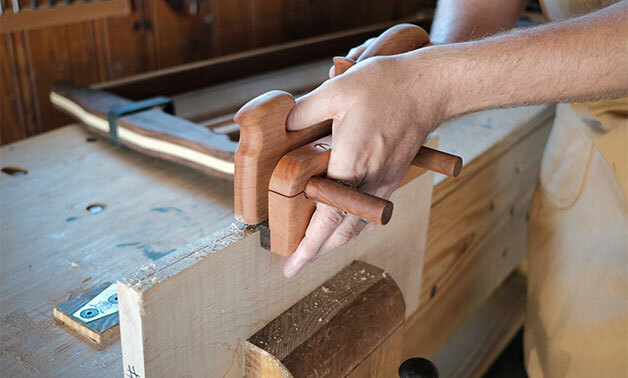 I was laying some oak bullnose trim on the kickplates of my kitchen cabinets today and used the x-cut saw and the bench hook for that, and all I can say is wow - 4 or 5 strokes and I was through the wood. My 12 year old actually cut most of the pieces including the miters. He was loving it. It was his first time using a hand saw. I didn't even break out the powered miter saw (man, was that refreshing). All I can say is THANK YOU! "I just received the saw on Saturday and as usual you did a great job of packaging. I must say that the first impressions of the saw are amazing (the mesquite handle and black nickel with nitre blue fasteners is a great combination) - it is a truly stunning tool with flawless fit and finish. I gave it a try yesterday cutting some practice dovetails and have to say that it works as well as it looks - I've used LNs, Veritas and a Cosman, but I already like this the best - even though it is 15 tpi, it starts as easily as my Veritas 20 tpi but also cuts faster and very straight - basically all I can ask for in a dovetail saw. Thanks!" 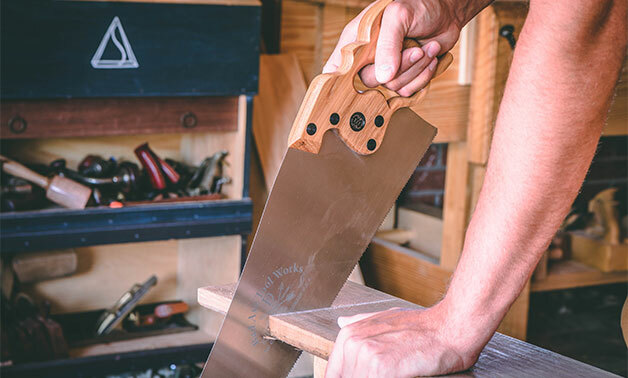 "The first thing you notice about the saws Mark creates is their stunning looks. 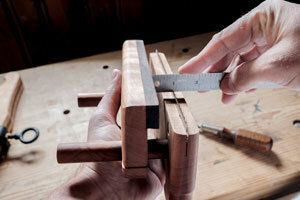 Of course being a woodworker I am picky about the tools I own. Lots of tools look good but do they perform? 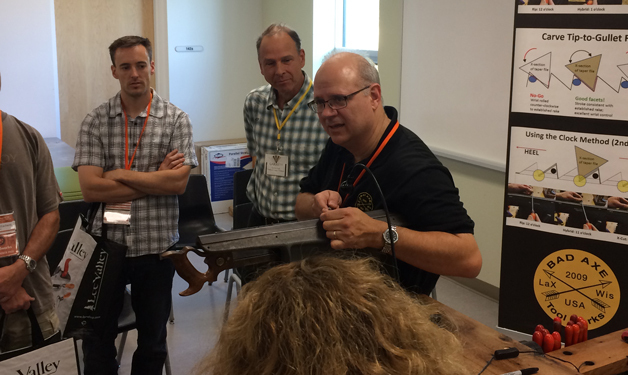 It only took a few saw strokes with one of their demo saws and I can honestly say I was hooked. 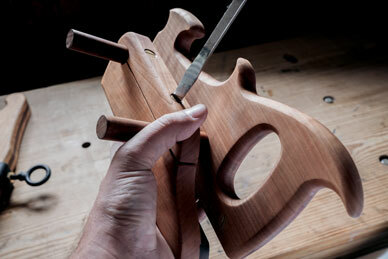 The ease of which the saw cuts through wood is amazing. These saws cut faster and cleaner than any other saws I owned, and I own most of the middle to high end saws out in the marketplace. Unparalleled performance is what you get out of a Bad Axe Saw." "Options are the real beauty behind buying a Bad Axe Saw. 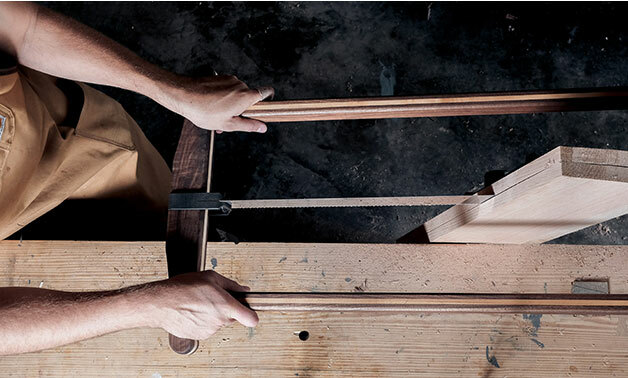 From the wood species and size of the handle to the metal used for the back and saw nuts to custom filings. When he's done your saw will look and perform exactly like you want. How are you going to go to the Bad Axe Emporium and not come away without making some saw dust? Come on man, this 10" 15 ppi "Doc Holiday" dovetail saw tore right through 5/4 white oak without even stressing about it. This is something I continue to be amazed at. It's something that in my estimation a high ppi saw shouldn't be able to handle, but Mark's saws laugh at the challenge." 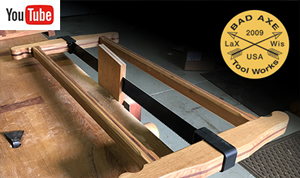 Bad Axe offers premium saws ready to ship. Below you'll find fresh troops ready to deploy in your workshop in dress uniform. 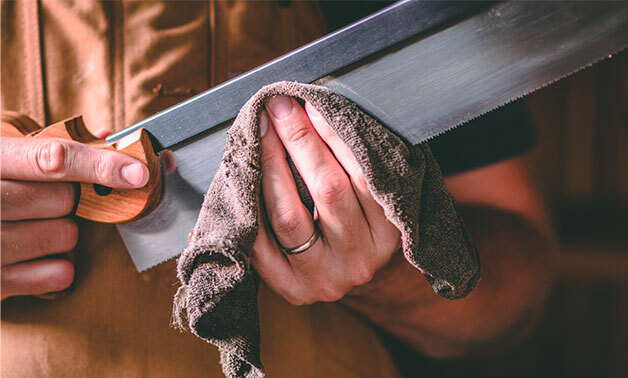 These saws represent our most popular combinations of filings, alloys, wood species and finishes guarranteed to sever wood fiber like it's on rails and look good while doing it. 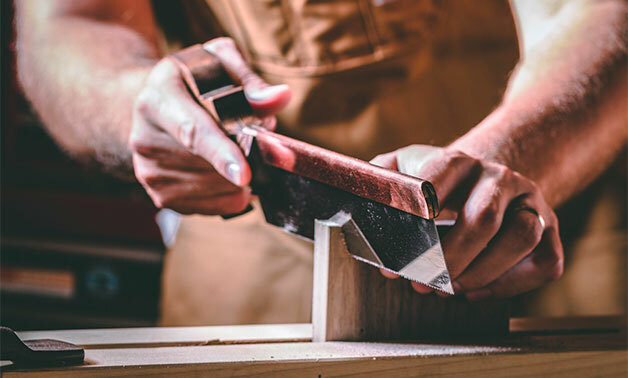 Here, you'll find dovetail, carcase, sash and tenon saws filed to your custom choice of dediated rip, hybrid-cut, and crosscut and tuned for your exact purpose. NOTE: Saws ship within the following 4 business days. Pay close attention to handle size. Configurations are sold as is. Don't see what you want below? Check out our distributors located here in the US, Canada, Britain, Sweden and The Netherlands! Our new finished Kerfing plane with adjustable fence is ready to ship! Available in four species just like our frame saws. Shipping sticker shock alert: These finished and assembled frame saws are shipped in large boxes measuring 49 x 25 x 5. Typical UPS charges average $40 - $50 per shipment. 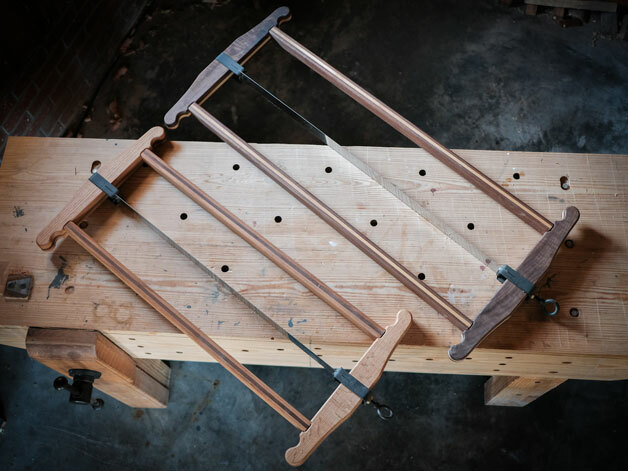 These are completed and finished frame saws--hammer-set & sharpened, ready to ship. Details and Specifications can be found here. 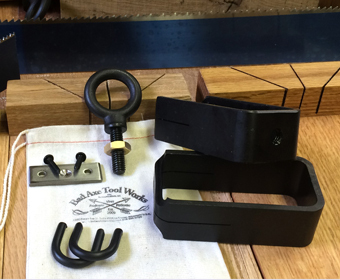 Balance of hardware kit for the frame saw. 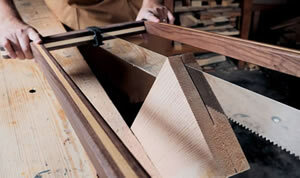 We provide all metal components required, and you source the wood. Size regular. Price: $275. Retail: $295 - $25 off due to small dents on the front sides of the handle cheeks (you have to look for them) discounted price= $275.